For successful completion of this guide, one of the steps is to publish resources from a Remote Desktop Server. As a result, Terminal Services (for Windows Server 2003) or RDS Services (for Windows Server 2008 and following releases) with available TS/ RDS CALs is required. Before proceeding, make sure that you are logged into the computer where you'll be performing the installation with an account that has administrative privileges. 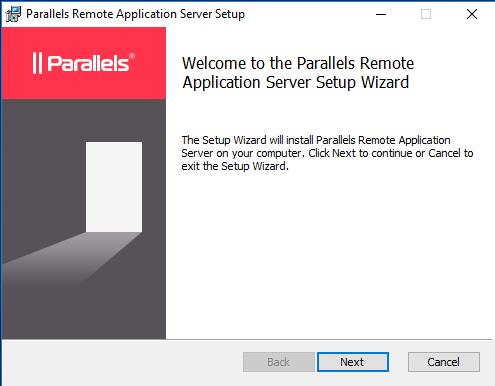 click the RASInstaller.msi file to launch the Parallels Remote Application Server Setup Wizard. Review and approve the end-user license agreement and click Next. Specify the folder location where Parallels Remote Application Server will be installed and click Next. 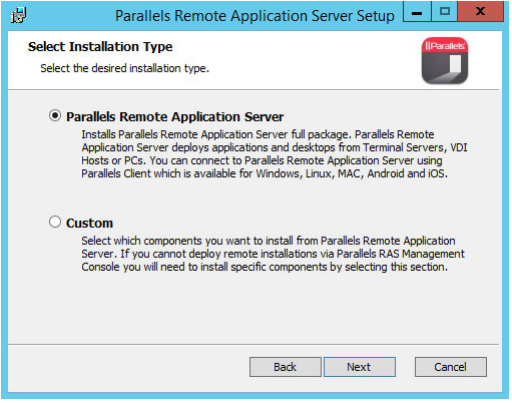 Select Parallels Remote Application Server to run the default installation. Select Custom and then (after clicking the Next button) specify the components to install. If there's a port conflict on your computer, review the notice on the Important Notice wizard page. You can resolve the conflict later. 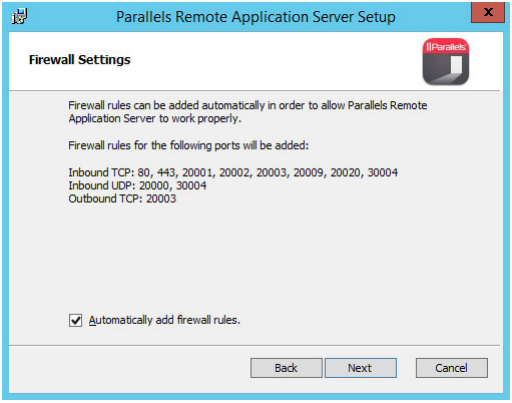 On the Firewall Settings page, select Automatically add firewall rules to automatically configure the firewall on this computer for Parallels Remote Application Server to work properly. Wait for the installation to finish and click Finish. Once the product is installed, it is ready for configuration and first-time use. Farm: A Parallels RAS farm to connect to. Enter the FQDN or IP address of the server where you have RAS Publishing Agent installed. If you've installed all core RAS components (Publishing Agent, Secure Client Gateway, etc.) on the same server, enter that server name or address. If you've installed all Parallels RAS components on the local server, you can enter "Localhost". 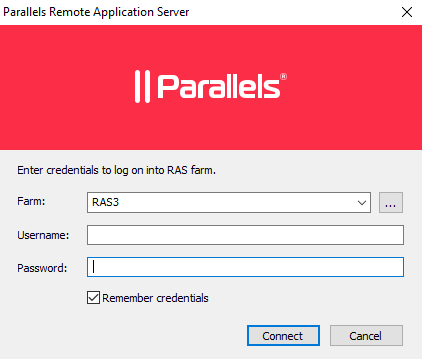 The first time the Parallels Remote Application Server Console is launched, you need to specify the credentials of a user with administrative privileges (usually a domain or local administrator). The user name must be specified using the UPN format (If Active Directory credentials is used login format should be username@domain_name. If Active Directory credentials are not used please use local administrator account credentials in following format: administrator_user@local_machine_name). 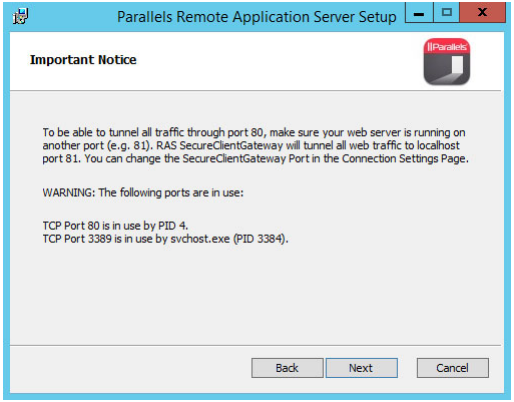 The specified user will be automatically configured as the Parallels Remote Application Server administrator.